Here are some fascinating 3D bathroom designs that will transport you into a totally different world. 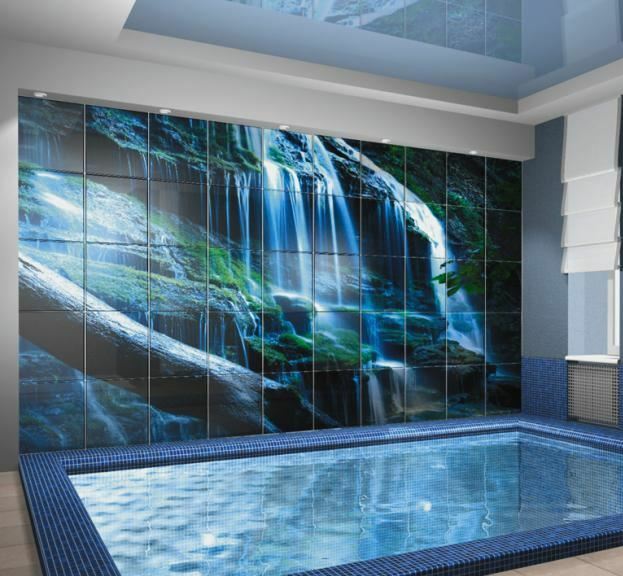 These 3D designs can be created using 3D bathroom tiles or 3D bathroom murals. Gone are the days when we had those boring bathrooms. Now, just open the door and step into a world full of adventure and thrill. 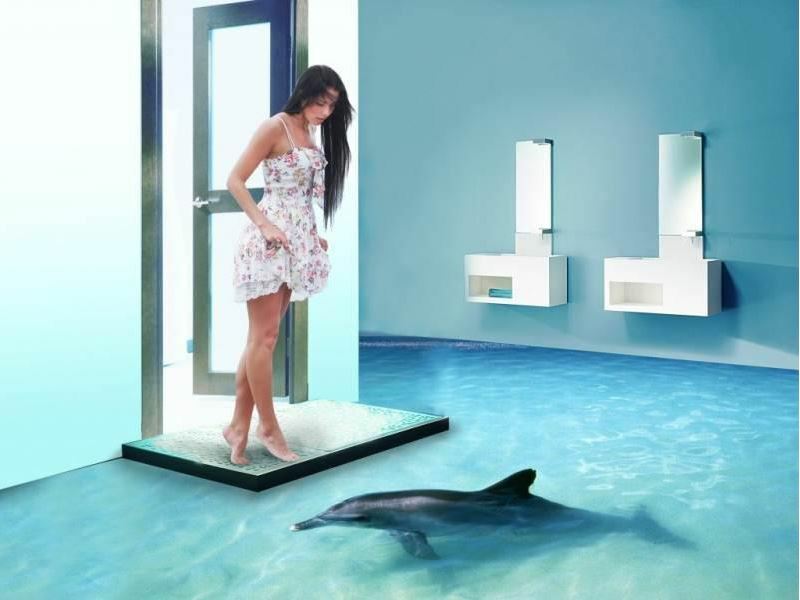 How about having a shower with dolphins around? 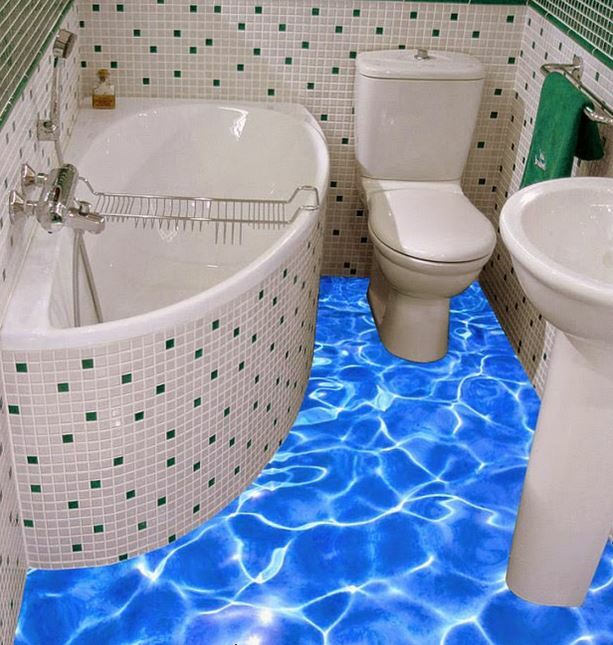 This bathroom floor makes you feel like you are in the middle of an ocean. Get these cool 3D bathroom designs for your bathroom. 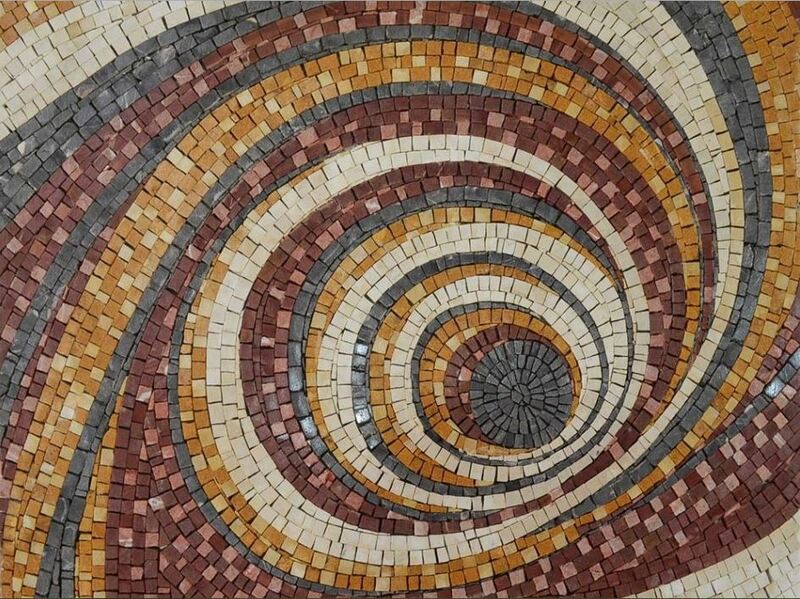 Create a whirlpool in your bathroom by adding these mosaic bathroom tiles. Place them on the floor in circles to get this look. 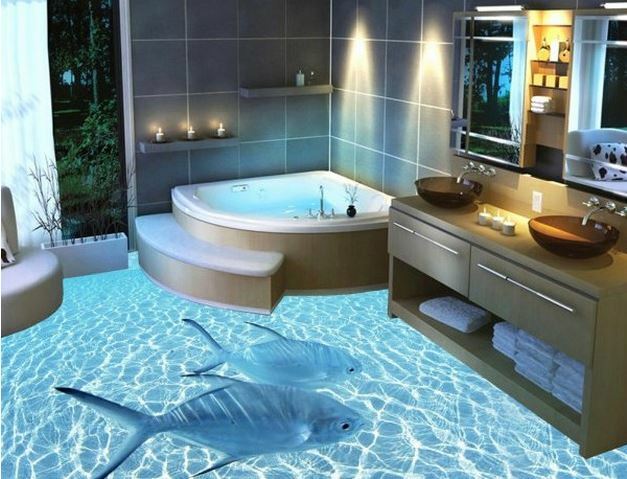 You can go fishing in your bathroom. 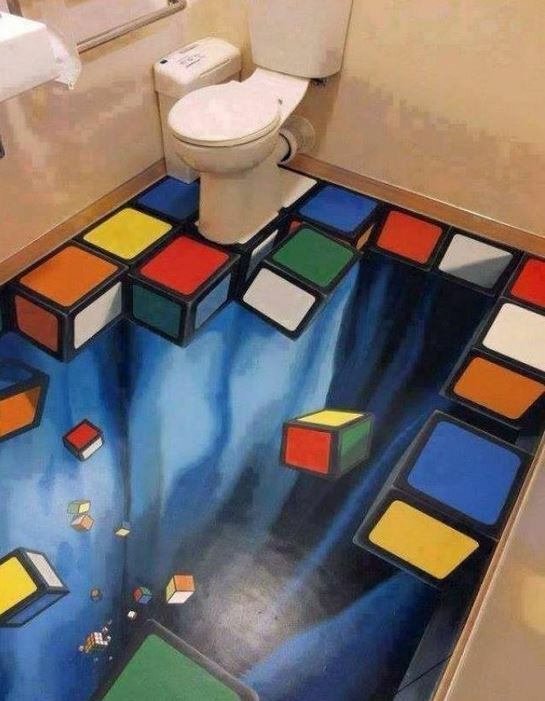 Install 3D bathroom tiles or go for 3D murals to get this realistic effect. What a lovely waterfall! You can also opt for 3D bathroom designs for walls. Choose from a range of 3D bathroom tiles available in the market. 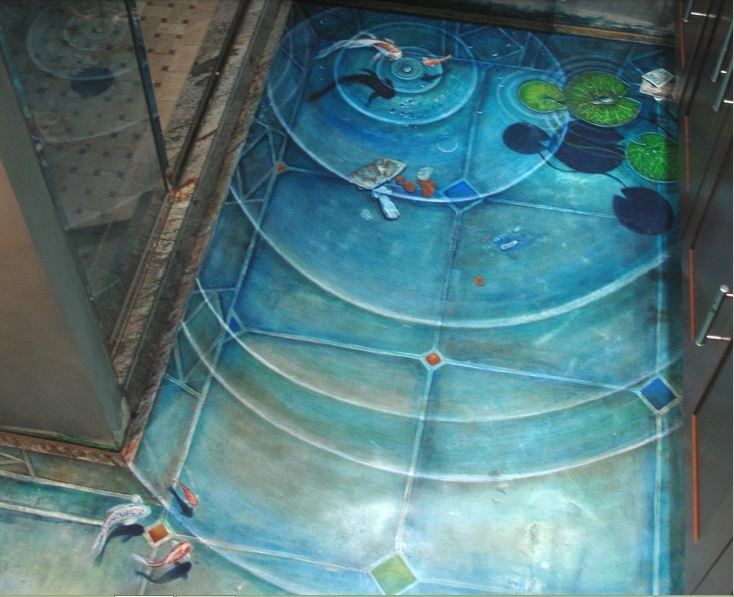 Cover your bathroom floor with 3D bathroom mural designs. 3D murals are used to give a natural feel to any place. Stand in your bathroom with waves washing your feet. 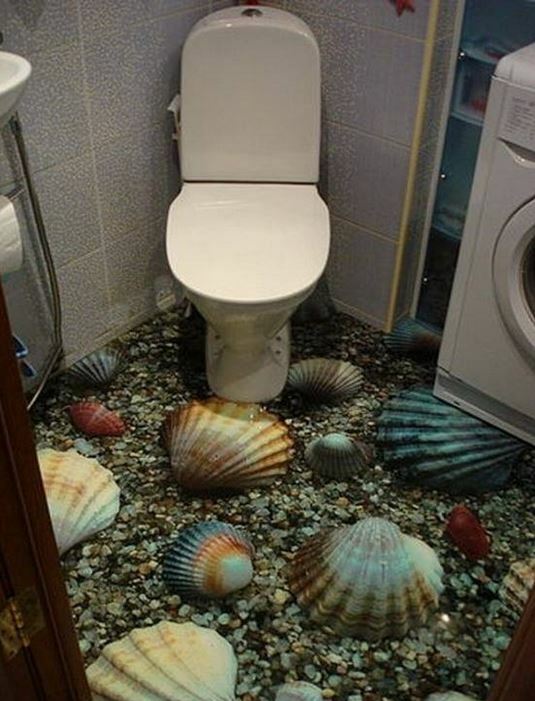 Now you don’t need to collect shells from the sea as you already have them in your bathroom. Here is a scary one! The floor of this bathroom seems to fall apart. 3D effect is not confined to movies, paintings or stickers, but they have entered our bathroom too. Enjoy deep-sea diving and mesmerizing underwater life. Pick up these 3D bathroom designs with colorful corals and fishes. Your guest instantly closes the door of your bathroom in horror and starts running frantically all over the place. Well! 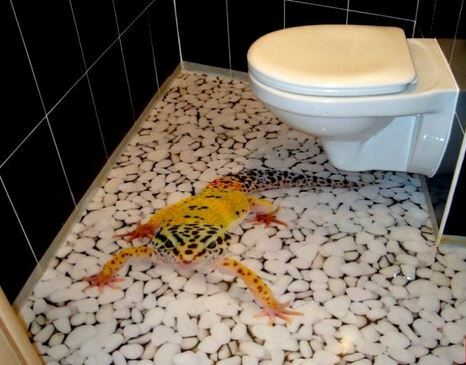 This is bound to happen when you find a giant lizard crawling in the bathroom. 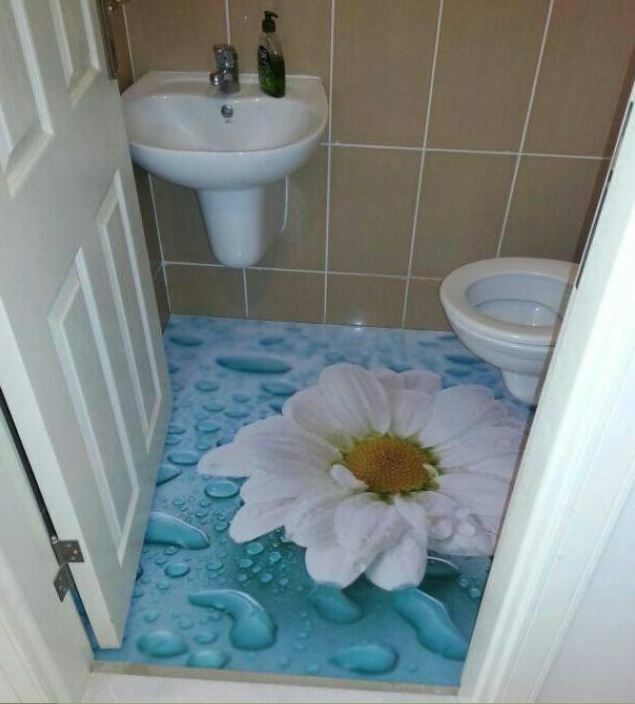 If you love flowers, go for this floral 3D bathroom floor design. You can choose any flower mural or tile of your choice. I love this fresh, dewy 3D bathroom floor. 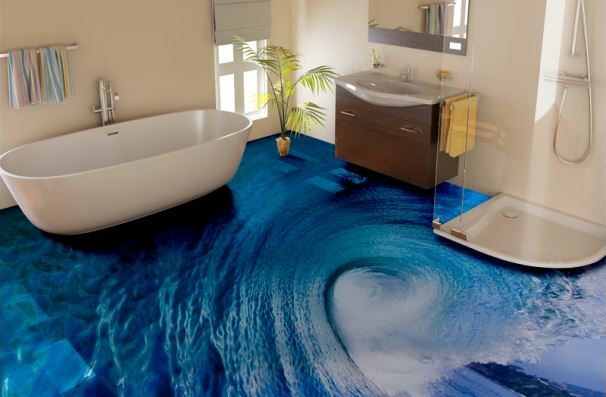 Use 3D murals to get this kind of design on your bathroom floor. Most of us love spending time on the beach. So, get up and walk directly on to the beach every morning. It’s the most gorgeous view anyone can wake up to. This bathroom may look like a sci-fi movie set, but it’s a 3D bathroom floor design. I guess many of us will think twice before stepping in there. Stick 3D stickers and turn your kid’s bathroom into a fun zone. 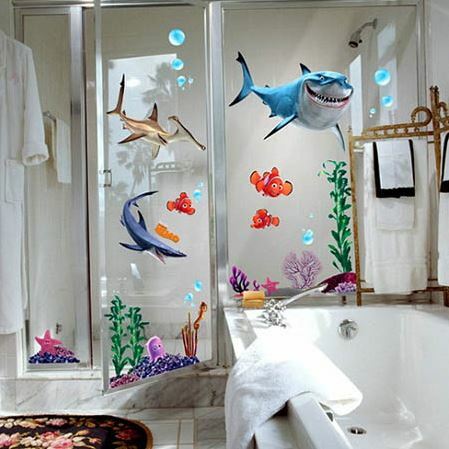 Stickers from the movie “Finding Nemo” have been used to decorate the bathroom. Stick them on to the glass shower enclosure. Take a look at this lively small pond with fishes and Lotus leaves in there. The bathroom floor is full of life. 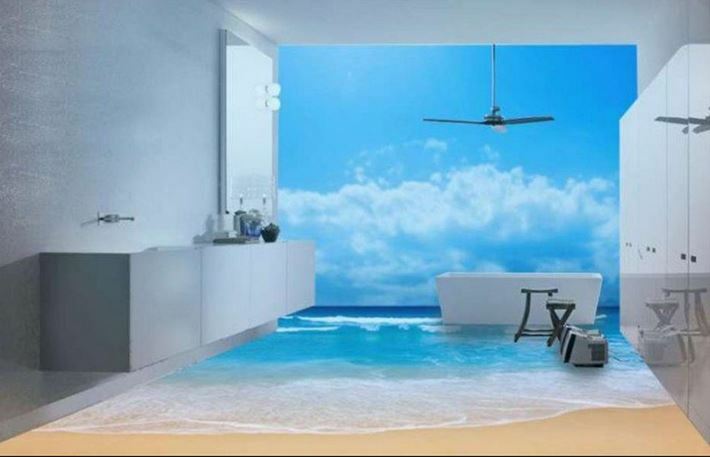 This entry was posted in Bathroom, Bathroom Designs and tagged 3D Bathroom, 3D Bathroom Design, 3D Bathroom Designs, 3D Bathroom Floor, 3D Bathroom Floor Designs, 3D Bathroom Floor in India, 3D Bathroom Floor Murals, 3D Bathroom Floor Paintings, 3D Bathroom Floor Tiles, 3D Bathroom Tiles, 3D Bathroom Tiles India, 3D Bathroom Wall Designs, Bathroom, Bathroom Decor, Bathroom Decor Ideas, Bathroom Decor India, Bathroom Design Ideas, Bathroom Design India, Bathroom Designs, Bathroom Ideas, Bathroom Interior Design Ideas, Bathroom Tiles, Cool Bathrooms, Eccentric Bathrooms, Interesting Bathroom Designs, Kids Bedroom Design, Unique Bathroom Ideas by Homemakeover. Bookmark the permalink. Where can I buy these 3D tiles for my bathroom and what would be the tentative cost ? I worked as builder I have lots of requirements of tiles so please send me the detail of all types of 3d tiles. Pls let me how we can get these tiles and business to get it further. How u can do it . Please give me some idea how do this type of business with u .
I worked as builder I have lots of requirements of tiles and this type of 3d,so please send me the detail of all types of 3d designs and how can we do this business with u.
Hi, I want to buy this 3d tiles for my new home, please contact me soon. I’M IN VIETNAM, I WANT TO TRADE THIS PRODUCT, HOW CAN’T I BUY IT. I want to buy this tiles pls contact me.. Please contact need to buy for our hotel rooms n bathrooms. Hi i want to buy these 3d tiles kindly contact me if any deals in these tiles. Contact me. I’d love to do this in my new bathroom. Where can I find a contractor? I am looking for 3d tiles floor for my bathrooms..will u guide me..
My bathroom sizes r 6*12..I need a quotation and feeding for my bathrooms. Dear Sir/Madam, I am interested to promote 3D flooring system in Odisha, Actually I always interested to promote New innovative technologies/Products. When Induction Stove lunched in India I was the first luncher. So please provide me the procedure for it. My Mob/what’s app No: 9439165207. Please contact me on what’s app, Or call me. Could you please let me Know the procedure to order such tiles for my home. Hi I am want to fix the 3d design for my bathroom. In Chennai u have any showroom . Hi sir/mdm, I’m from Malaysia. I like to deal with your business. 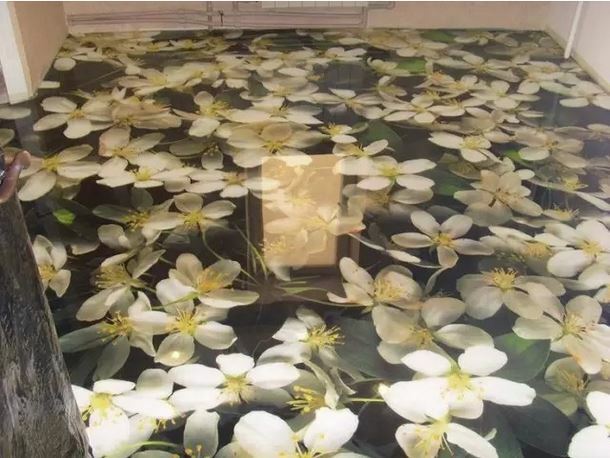 I am in Kerala ..
Pls give me contact nomber. .
Hi, I want to buy this 3d tiles for my new home, please contact me soon.I like to deal with your business. I m interested in 3 d tiles pls contect me. 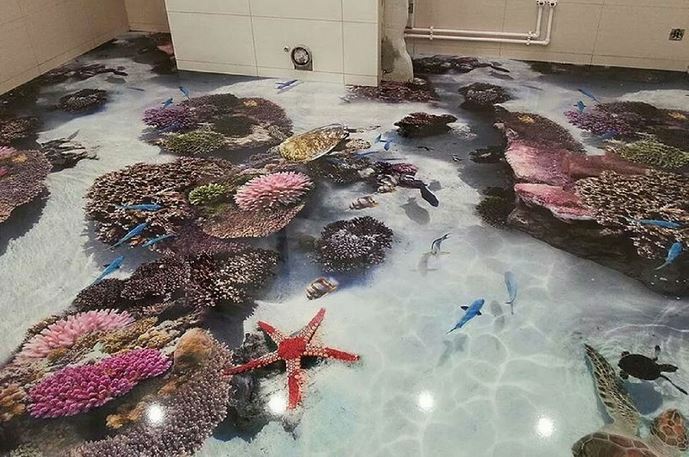 I want to get 3d floor to be made in my house . But i dont know whom to contact so if you can help me please do so. Hi i am from india and i am interested to doing trading in this product so can u share your number and addares. I want buy these 3d tiles…plz contact as soon. Please send me your contact number and address and price list. I want 3D tiles for my new home. Pl tell me how it should be order& give any conatct number if any. I want it in Maharashtra India at Aurangabad city. I want 3D tiles for my new home. Pl tell me how it should be order & give any contact number if any. I want it in Maharashtra India at Satara Dist.Karad city.